My Cryptobit operates in the MLM cryptocurrency niche. Although My Cryptobit provides a full list of executives on their website, most have little to no social footprint – which is always suspicious. Two names I was able to peg to My Cryptobit are David Bras and Ozcan Come. On the My Cryptobit website Come is cited as the company’s owner, CEO and founder. 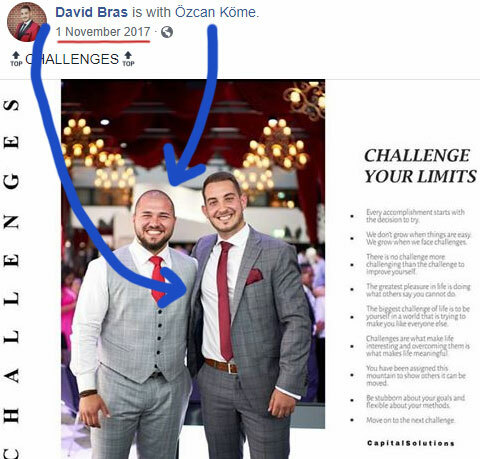 David Bras is only cited as “Department Marketing Content”, however on his Facebook profile he also identifies himself as a My Cryptobit owner and founder. Whatever Capital Solutions was, it was abandoned in October 2017. Ozcan and Bras founded My Cryptobit a month later in November. Read on for a full review of the My Cryptobit MLM opportunity. My Cryptobit has no retailable products or services, with affiliates only able to market My Cryptobit affiliate membership itself. My Cryptobit affiliates invest funds on the expectation of a ROI. The public are of My Cryptobit’s website does not provide any information on the investment side of the business. My Cryptobit affiliates pay up to $1500 in membership fees when they sign up, which the company uses to pay recruitment commissions. There are thirteen affiliate ranks within the My Cryptobit compensation plan. My Cryptobit pays recruitment commissions via a unilevel compensation structure. My Cryptobit cap payable unilevel team levels at ten, however affiliates initially only qualify to earn commissions on three levels. After personally recruiting at least three affiliates and building a total unilevel team of at least fifteen affiliates, a My Cryptobit affiliate earns residual commissions on all ten available levels. My Cryptobit take 10% of “weekly profit” and place it into ten separate Global Bonus Pools. Additional funds are required to participate in My Cryptobit’s attached investment opportunity. At its core, My Cryptobit is an MLM cryptocurrency investment opportunity with a prohibitively expensive entry-fee. There’s a few reasons for this I can think of; namely that there’s an expectation most investors will front $500 for three months, see if they get paid and then commit. Secondary to this is the need to divert affiliate fees to pay affiliates participating in the attached investment opportunity. Although they claim to generate ROI revenue through trading, My Cryptobit provides no hard evidence of trading revenue being used to pay affiliates. My Cryptobit do offer a list of purported trades on the “performance” section of their website. These however are meaningless and are not a substitute for audited accounting. Owing to the passive nature of My Cryptobit’s investment opportunity, it’s obviously a securities offering. Nowhere on their website does My Cryptobit provide any information to suggest it is registered with securities regulators in any jurisdiction it operates in. This alone makes My Cryptobit illegal in every country that regulates securities (almost all of them). Below securities fraud investors also run the risk My Cryptobit is engaged in Ponzi fraud. 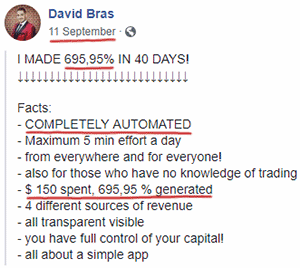 In the absence of any evidence whatsoever to the contrary, the alternative is David Bras and Ozcan Kome, neither of whom have visible trading backgrounds, woke up one day and started generating a 695% ROI every 40 days. And they’ll let you in on the gravy train for a measly $125 a month.